Correct your grammar! Here are the 20 rules in subject verb agreement with examples. 1. 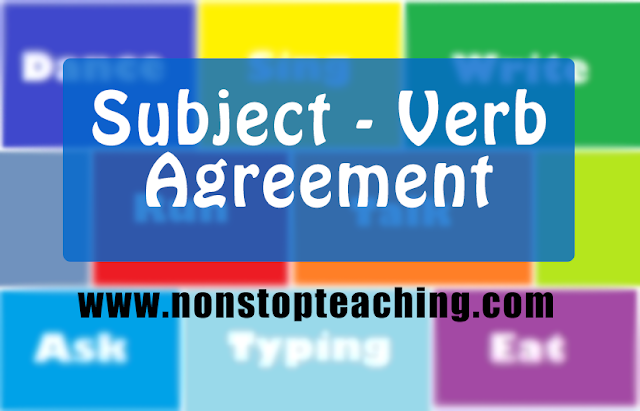 Subjects and verbs must agree in number. This is the cornerstone rule that forms the background of the concept. · The baby cries when he is hungry. · The babies cry when they are hungry. · The dog eats bones. · The dogs eat bones. · The apple is sweet. 2. Don’t get confused by the words that come between the subject and verb; they do not affect agreement. · The cat, who is chewing on my jeans , is usually very good. · The plants, which grows in our backyard , are very nice to the see. · The boy, who pushes the carts is my friend. · The ants in the ant-hill are working. · The knight under the trees is the guard. 3. Prepositional phrases between the subject and verb usually do not affect agreement. · The colors of the bag are beautiful. · One of the schools in Pampanga is implementing a new curriculum. · Bones of the cow are nutritious. · The computers found in the library are new. · Schools in this town are very nice. 4. When sentences start with “there” or “here” the subject will always be placed after the verb, so care needs to be taken to identify it correctly. · There is a problem with the internet connection. · Here are the files you requested. · There are some computers left in the library. · Here is your ball pen. · There is an error with the codes. 5. Subjects don't always come before verbs in questions. Make sure you accurately identify the subject before deciding on the proper verb form to use. · Does Doggy usually eat fish ? · Where are the pieces of this collection? · Is there something wrong with Lina? · Who is the president in this institution? · Where are the songs in this album? 6. If two subjects are joined by and , they typically require a plural verb form. · The singer and the actress are from different country. · My father and I will go to market today. · The lawyer and the judge will go to the court later. · The teachers and the principal will have a meeting. · The police and the detective will have the case. 7. The verb is singular if the two subjects separated by and refer to the same person or thing. · Red beans and rice is my favorite dish. · Ham and bread has been my favorite snack. · Spoon and fork is used in eating. · Shoes and socks is the gift that I received. · Pen and Note is my tool in school. 8. If one of the words each, every, or no comes before the subject, the verb is singular. · No eating or drinking is allowed. · Every man and woman is required to take the survey. · Every child is special to God. · No man is an island. · Every student is required to wear proper uniform. 9. If the subjects are both singular and are connected by the words or, nor, neither/nor, either/or , and not only/but also the verb is singular. · Erick or Christian is to blame for the accident. · Neither Lina nor Cathy was absent yesterday. · Either apple or grape is sweet. · Neither Marco nor Vincent is good in class. · Either Jessy or Daisy is good in singing. 10. The only time when the object of the preposition factors into the decision of plural or singular verb forms is when noun and pronoun subjects like some, half, none, more, all, etc. are followed by a prepositional phrase. In these sentences, the object of the preposition determines the form of the verb. · All of the chicken is gone. · All of the chickens are gone. · None of the apples are eaten. · None of the apple is eaten. · Some of the oranges are eaten. 11. The singular verb form is usually used for units of measurement or time. · Four quarts of oil was required to get the car running. · One half of the members of the cabinet believes that president is responsible for the incident. · Two third of the spectators of the concert shouts when the show started. · Eight o’clock is the start of the class. · One fourth of the class is absent. 12. If the subjects are both plural and are connected by the words or, nor, neither/nor, either/or , and not only/but also , the verb is plural. · Dogs and cats are both available at the pet shop. · The president and the former PNP chief are both responsible for the misencounter. · Apples and grapes are both sweet. · Teachers and students are part of the teaching – learning process. · Scientists and inventors are great people. 13. If one subject is singular and one plural and the words are connected by the words or, nor, neither/nor, either/or , and not only/but also , you use the verb form of the subject that is nearest the verb. · Either the tigers or the lion has escaped from the zoo. · Neither the lion nor the tigers have escaped from the zoo. · Either the teacher or the students have participated on the show. · Neither the principal nor the teachers are the performer. · Either the police men or the criminals are dead. 14. Indefinite pronouns typically take singular verbs. · Everybody wants to be loved. · Nobody has passed for the examination. · Someone is waiting outside the hall. · Anybody is the player of the game. · Somebody starts the drill. 15. Except for the pronouns (few, many, several, both, all, some) that always take the plural form. · Few were left in the school after the parade. · Many people were stranded during the typhoon. · Some are gathering their data about the experiment. · Both police and criminal were found dead. · All are good in the game. 16. If two infinitives are separated by and they take the plural form of the verb. · To sing and to play guitar require great skill. · To sketch and to paint are his talent. · To dance and to sing are her talent. · To belt and to sing are difficult. · To glide and to fly are extraordinary. 17. When gerunds are used as the subject of a sentence, they take the singular verb form of the verb; but, when they are linked by and, they take the plural form. · Standing in the tower was a bad idea. · Swimming in the river and playing guitar are my hobbies. · Singing is my hobby. · Dancing and singing are quite difficult. · Playing basketball is very tiring. 18. Collective nouns like herd, senate, class, crowd, etc. usually take a singular verb form. · The faculty is going to participate in the program. · The crowd is very thick. · The senate decides to make the judgement. · The class is the participant of the meeting. · The yellow team is the winner. 19. Titles of books, movies, novels, etc. are treated as singular and take a singular verb. · The Tomorrow land is a movie starring George Clooney. · Back to the future is my favorite movie. · Noli Me Tangere is a great novel. · Assessment of Learning Outcomes is our reference book in this subject. 20. Use the singular form of the verb if the subject is singular, and plural if the subject is plural except for the word I and You. · I have two hands. · You are the best for me. · You are my last hope. · I have my money inside the bag. · You are the shining star.